, D. D. bishop of Chester, the youngest son of the preceding sir John Feme, was born at York in 1603, and educated at the free-school of Uppingham in Rutlandshire, to which he was sent by sir Thomas Nevill of Holt in Lancashire, who had married his mother. He was afterwards, in 1618, admitted commoner of St. Maryhall, Oxford, but after two years 1 residence there, was removed to Trinity college, Cambridge, of which he became fellow; apd when he had taken his degree of bachelor of divinity, was domestic chaplain to Dr. Morton, bishop of Durham. The year after he was presented to the college living of Masham in Yorkshire, and his brother-in-law Mr. Nevill gave him that of Medborn in Leicestershire. The?­bishop of Lincoln afterwards preferred him to the archdeaconry of Leicester. In 1642 he took his doctor’s degree, and kept the act at the commencement. Thence he went into Leicestershire, where he had an opportunity of waiting on the king, and preaching before him as ho was going to Nottingham to setup his standard. The king made him his chaplain extraordinary, and he preached before his majesty again at Nottingham. In 1642 he published his “Case of Conscience touching rebellion,” and is said to have been the first that wrote openly in his majesty’s cause, but this probably obliged him to leave Medborn, and take shelter in Oxford, where he preached, without any emolument, at St. Aldate’s church. Here he was incorporated doctor in divinity, and was made chaplain in ordinary to the king, who at the same time sent him a message, that he was sorry he could confer nothing else with it. He was afterwards appointed chaplain to one of the lords commissioners at the treaty of Uxbridge, where at the request of some of them, he stated the case between piscopary and presbytery, and was not answered by the | parliamentary commissioners, although one of them, the earl of London, lord chancellor of Scotland, declared that he should. 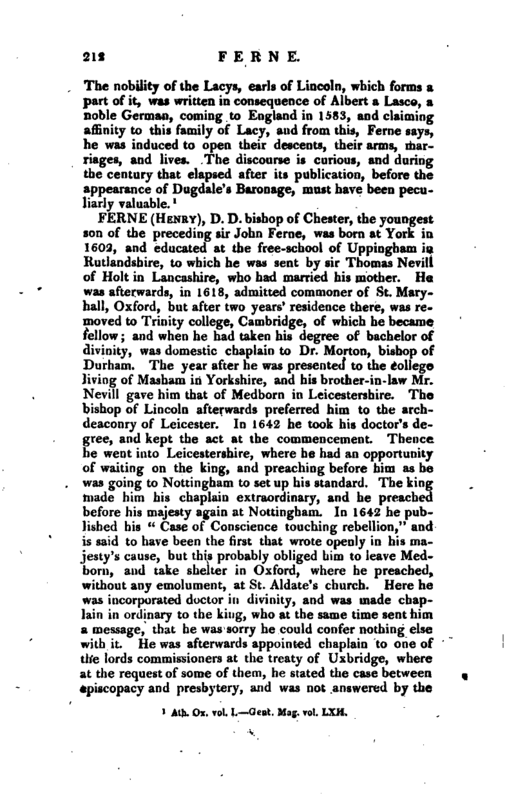 Dr. Feme attended the king at Oxford until he had taken Leicester, and was present at the unfortunate battle of Naseby, after which he went to Newark, and continued preaching until the king ordered the garrison to surrender. His next retreat was to Yorkshire, where he remained with his relations, until his majesty sent for him to the treaty of the Isle of Wight. His majesty had so much respect for him, as to desire a copy of the last sermon he preached there. 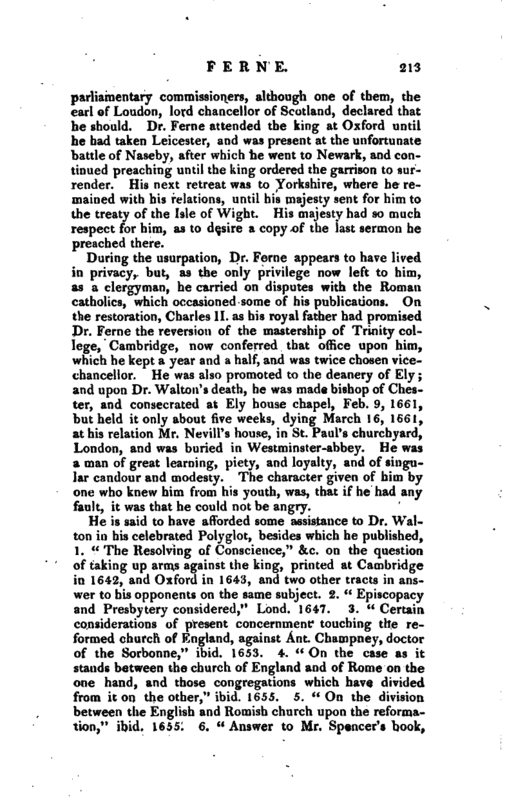 During the usurpation, Dr. Feme appears to have lived in privacy, but, as the only privilege now left to him, as a clergyman, he carried on disputes with the Roman catholics, which occasioned some of his publications. On the restoration, Charles II. as his royal father had promised Dr. Feme the reversion of the mastership of Trinity college, Cambridge, now conferred that office upon him, which he kept a year and a half, and was twice chosen vicechancellor. He was also promoted to the deanery of Ely; and upon Dr. Walton’s death, he was made bishop of Chester, and consecrated at Ely house chapel, Feb. 9, 1661, but held it only ahout five weeks, dying March 16, 1661, at his relation Mr. Nevill’s house, in St. Paul’s churchyard, London, and was buried in Westminster-abbey. He was a man of great learning, piety, and loyalty, and of singular candour and modesty. The character given of him by one who knew him from his youth, was, that if he had any fault, it was that he could not be angry. Ath. Ox. vol. II. Walker’s Sufferings of the Cergy. 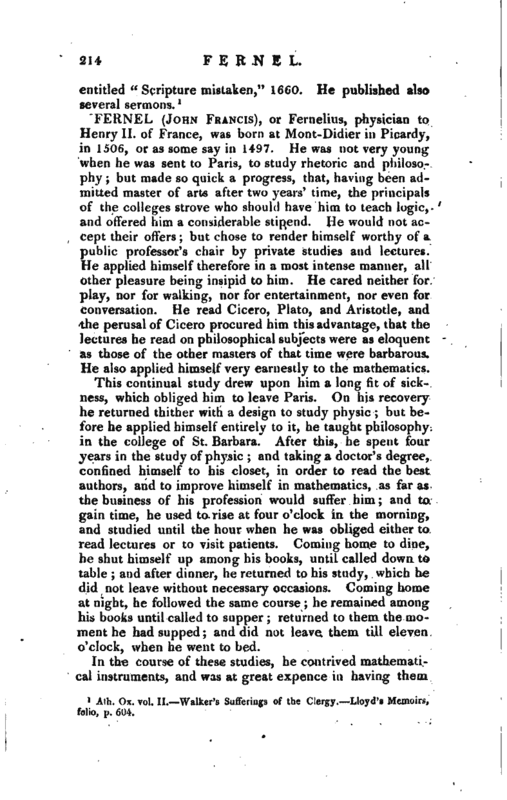 Lloyd’s Memoirs, folio, p. 604.